MeeCreeps are early game creatures that can help you do various small tasks. Like build a house, harvest crops, dig down a shaft to bedrock, light up the area, ... You spawn them, they perform a task and then they disappear again. 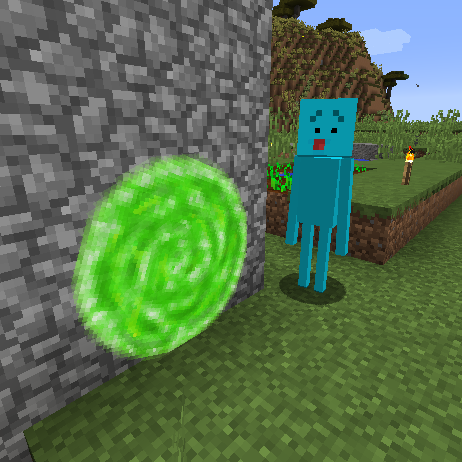 This mod also contains a portalgun that allows you to make connections between two spots in the world. Current version is still beta. More actions are planned for the MeeCreep. Do you have plans to update this mod to 1.13.2?? Would you like any suggestions for the crafting recipes? the amount of locations the portal gun can hold needs to be AT LEAST doubled, yeah yeah balance and all that, a config setting seems like the best way to make everyone happy i think the easiest way to do it is just add left and right buttons in the middle of the destination select circle and a config for the amount of pages. Hi, will there be new updates? Will you add something new? How do you like the idea of a portal to an alternative world? I love this sooo much! I was hoping there would be a config option to limit how much you could use the box. Thank you for all your hard work! Oh yeah, I know. I meant that when I first saw the mod it seemed a bit OP but when I found the option to put a cap on the usage it was perfect. I really like your mod！That's interesting. Love the mod, thanks. Seems OP; maybe the option for him to need tools and a GUI to give him the tools and the items he may need. I found a bug i dont know if its thermal expansion or meecreeps but every block that meecreeps destroys from the thermal expansion gets duped so if you have a strongbox full of diamond you will have 2 full strongboxes of diamonds same with machines cells andducts. Any Meecreep I sapwn in is now unable to break blocks when I choose any options from the flatten area menu. Also, they apparantly cannot break snow layer blocks for some reason. Edit: Apparantly any action that requires breaking blocks, the Meecreeps cannot do. Add the ability to specify a specific range rather than a set number of values.